Barclays Center, years in planning for such an important sports and entertainment venue, brilliantly welcomed New Yorkers and the world’s visitors in September 2012. And its wonder hasn’t slowed since that inaugural. The project was one of political and social debate for 10 years, with community disapproval, small-businesses demolished; then, the global recession. Today, Barclays Center is the heart of the Atlantic Yards district, a neighborhood that will continue to develop for living and commerce. 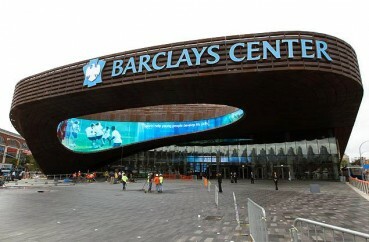 Truly multi-purpose, this is the official home for the Brooklyn Nets Basketball and the New York Islanders Hockey Team. The center has been awarded the important LEED® Silver Certification for New Construction, the first professional sports and entertainment venue in this metro area. The 38,885-square-foot (3,613 m2) entrance plaza features a “Transit Connection” structure as the focal point and connecting with the new Barclays Center subway station. Since Jay-Z’s opening concert, the talent hasn’t stopped appearing to sold-out crowds. The world’s great talent has found an incredible showplace for their performances. Fans of all ages fill the stadium to be part of the exhilaration. Just minutes away; if you’re looking for hotels near Barclays Center, make our Brooklyn hotel your choice.